Taken on Mar. 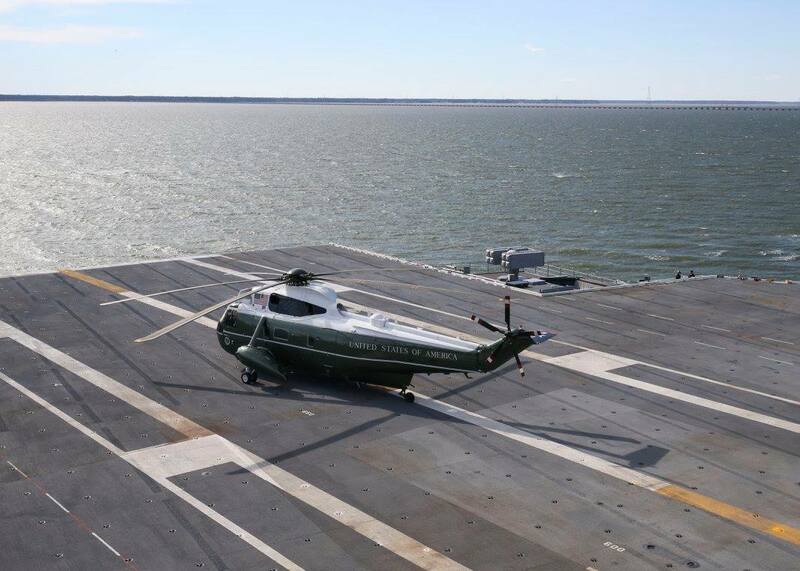 2, 2017 the interesting photos in this post show President of the United States (POTUS) Donald J. Trump arriving aboard Pre-Commissioning Unit Gerald R. Ford (CVN 78) on Marine One for a tour of the ship. 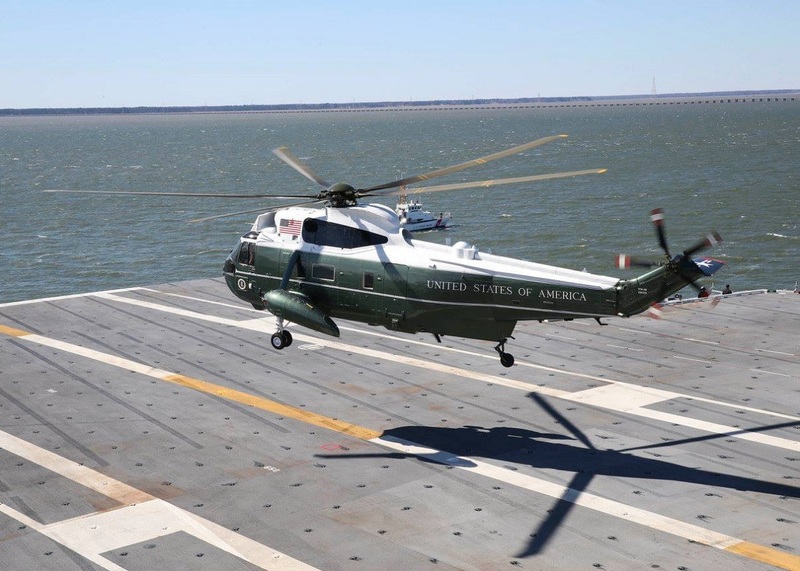 The president landed on the flight deck on Marine One (which actually is the call sign of any United States Marine Corps aircraft carrying the President of the United States and it usually denotes a helicopter operated by Marine Helicopter Squadron One (HMX-1 “Nighthawks”), either the large Sikorsky SH-3 Sea King or the newer, smaller VH-60N “White Hawk”) accompanied by Secretary of Defense Jim Mattis. They were welcomed aboard Ford by Chief of Naval Operations (CNO) Adm. John Richardson and Capt. Richard McCormack, Ford’s commanding officer. 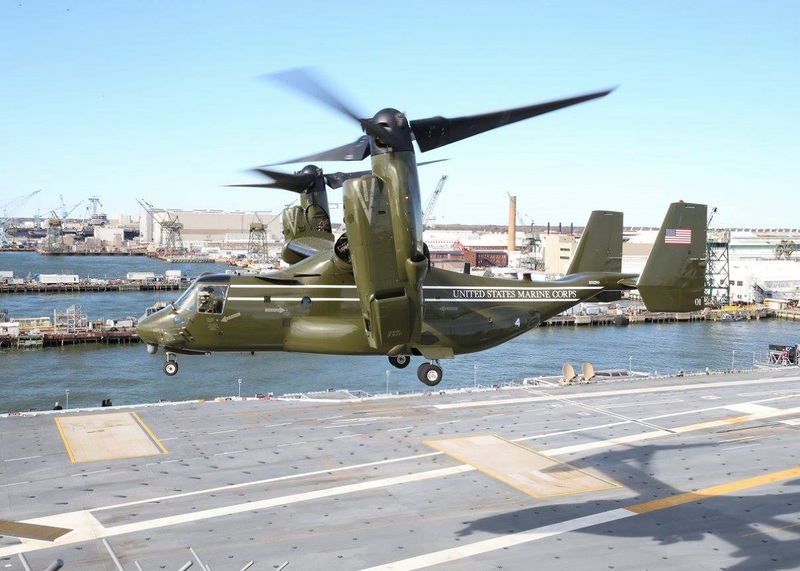 As it can be seen in the photos, Marine One was escorted by U.S. Marine Corps (USMC) MV-22 Osprey tilt-rotor aircraft. “This carrier and the new ships in the Ford class will expand the ability of our nation to carry out vital missions on the oceans and to project American power in distant lands,” Trump said to an audience of over 3.500. 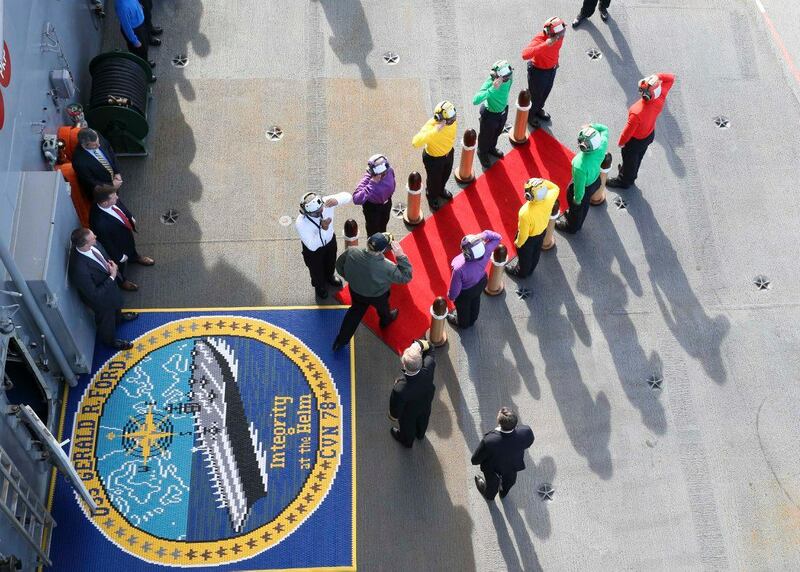 President Donald J. Trump passes through the ceremonial rainbow sideboys upon his departure from the aircraft carrier Pre-Commissioning Unit Gerald R. Ford (CVN 78). “It was an honor to welcome aboard our commander-in-chief,” said McCormack. “My Sailors have put tremendous work and energy into making Ford an operational asset to the fleet, and I could not be more proud to have him here to see this team.” Susan Ford Bales, daughter of President Gerald R. Ford and the ship’s sponsor, who greeted Trump on the flight deck and welcomed him into the captain’s inport cabin, where he met with Ford Sailors and shipbuilders for a roundtable discussion. Following a brief tour of crew habitability spaces and unique technology, Trump descended to the Ford’s hangar bay via an aircraft elevator for an “All Hands Call” with Ford Sailors and shipbuilders. The presidential visit marked a week full of “firsts”. It was Trump’s first visit to an aircraft carrier, and the first time the aircraft carrier, named in honor of the 38th president, Gerald R. Ford, had ever received a president. 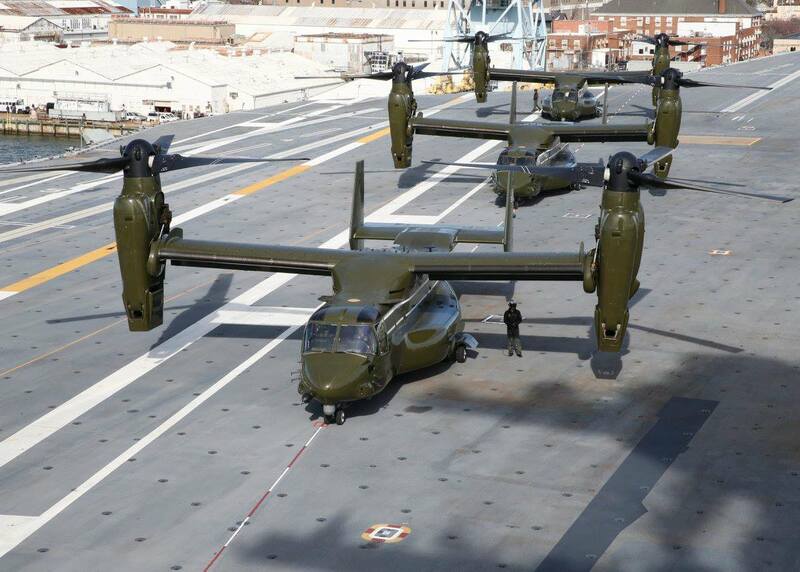 Earlier that week, an MV-22 Osprey marked a critical milestone in the life of the ship by becoming the first aircraft to land on Ford’s flight deck, making Ford the only ship to receive an aircraft before its commissioning.